It’s this time of the year again: SPRING! And I want to practice outside. I have to admit that I am not really good at it. Because – mosquitos. I don’t like them, however they looove me. Grr. But in spring, when there are not that many yet, it’s the best time for me to do Tai Chi in the park. First let’s start with a question: do you practice at home? If not, I recommend that you start at home first, I think that’s the best place to start Tai Chi for beginners. Just get into it without all the “spectators”. (Read: How to do Tai Chi at home). sister’s current dog), Charlie (my brother’s dog) and Peaches (my friend’s dog). Other than those, I am scared. And because I usually do not only practice Taijiquan but also Qi Gong outside, I want to be able to close my eyes and concentrate on myself. Instead of constantly thinking that a big German Sheperd is going to jump up on me. Or that a Dachshund pees on my bag in the grass (yep, that happened to me once!). Thus I prefer dog-free areas. I like to have some trees or bushes around me, at least behind me. Standing in complete open space is a bit intimidating, at least in the beginning. Obviously, at the beach, space is wide open. But if I am in a park, I’d rather stand in a corner or next to a strong tree than in an open field. But that really depends on what I need. Just feel inside: do you need nature’s embrace or open space? Outfit. Obviously you don’t want to wear stilettos. You might have a look at Tai Chi shoes for outdoor use. Because it’s not that useful to get those standard Tai Chi cotton shoes wet. But any comfortable shoes with no heel will do. Just consider that the sole is soft and you can actually roll your feet! Bring a Jacket, blanket or big scarf. Whenever you plan to do some seated exercises or meditation, you might like to cuddle in a huge blanket or a big scarf. Because when you relax you get chilled. Literally. Have something to keep you warm! Ignore the people around you. People will look. Some might even stop and stare. Never mind. Once you find your favorite spot, people will get used to you. Like all those joggers circling around you. As they notice how calm, relaxed and smooth you move, you might even inspire them to try Tai Chi themselves! I personally hope that more (Western) people will realize that Tai Chi is not only for old men in Chinese parks. But that it’s practiced all over the globe. And the most important recommendation I can give: Just try it. The first park you go to will most likely not the be last park you’ll ever practice in! Try morning Tai Chi or maybe practice on your way back home after work. Discover your area and find the sweet spot for you to do Tai Chi in the park! 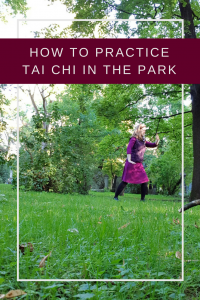 The best way to know how to do Tai Chi in the park is to actually do it! 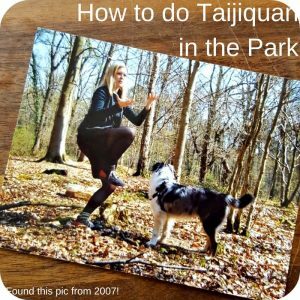 A really good opportunity to practice Taijiquan and Qi Gong outside is World Tai Chi & Qi Gong Day! There you’ll meet other enthusiasts from your town. Ask them where they like to do Tai Chi in the park, they might know some hidden spots. Or maybe you can even meet and practice together. I would add a couple of hazards to look out for. Holes (lumpy ground) and branches from nearby trees and shrubs. I find this to make outdoor practice more interesting but if you start thinking the great outdoors is as smooth as the dojo floor, you can get tripped up. Nice article. oh, yes, I agree. It is a big difference to stand outside and “deal with the ground”. I learned a lot from letting go of finding “the perfect spot”. Nowadays, I enjoy that the ground is uneven because I think we walk to much on smooth floors anyway.